Peepers may be the most relaxing game you will ever play. Easy enough for anyone to learn, yet challenging enough to keep you thinking for hours. Tonight all of the Spring Peeper frogs are gathering under the willow tree for a concert, but the frogs are trapped in their ponds! 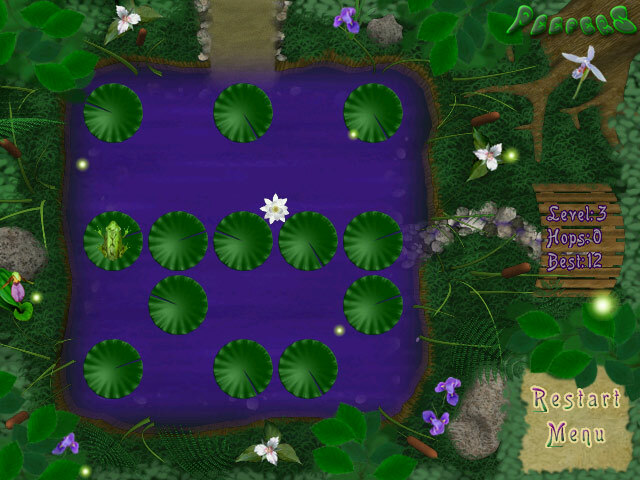 You must help the frogs escape by jumping from lily pad to lily pad. Peepers features beautifully rendered and hand drawn visuals, real relaxing guitar music, and adjustable brook and peeper sounds. Sit back and watch the fireflies meander through the night sky. Watch the frogs gather under the willow tree as they are saved, and dont miss the big concert when all the frogs are freed. Free hints and solutions are included online. 110 levels of nonviolent fun. Try Peepers today!